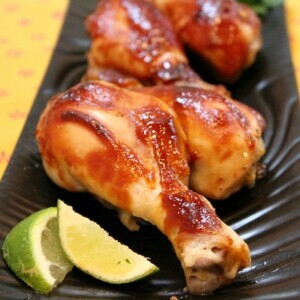 Here’s the latest quick and easy dinner that I whipped up: Hoisin Chicken Drumsticks. When my Facebook page hit 100K followers the other day, I took to the page to ask my collective audience what sorts of recipes they preferred to see. Many responded that they’d like to see more quick and easy, family-friendly dinners for weeknights. I hear ya! My life is so crazy busy, and I’m making recipes all the time… but when dinner rolls around, I don’t want to spend a whole lot of time in the kitchen. Quick and easy ideas are appealing indeed! With just FOUR ingredients, these chicken drumsticks couldn’t be any easier. When you get home from work, rub the quick-to-mix sauce on the drumsticks, shove them in the oven, and go slip into your yoga pants… have a glass of wine, read a book to your kids, take a few deep breaths, open the mail, watch some TV… you get the idea. Your chicken will be done in one hour! There it is- done! Serve with salad for a simple and healthy dinner. Add rice or potato if you feel the need for some carbs! It’s such a simple sauce, but it adds great flavor to the chicken. Serve it with lime wedges for squeezing if you like things limey. The chicken turns out juicy and tender. There you have it- an easy weeknight dinner recipe! Preheat the oven to 375 degrees F. Spray a 9x13-inch pyrex dish or casserole dish with nonstick spray. 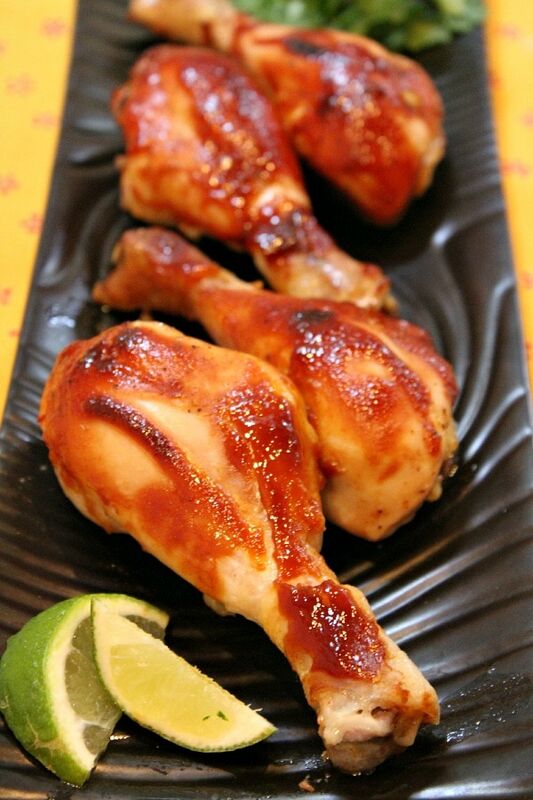 Mix the sauce: in a small bowl, whisk together the hoisin sauce, lime juice and pepper sauce. Place the drumsticks in the pan. 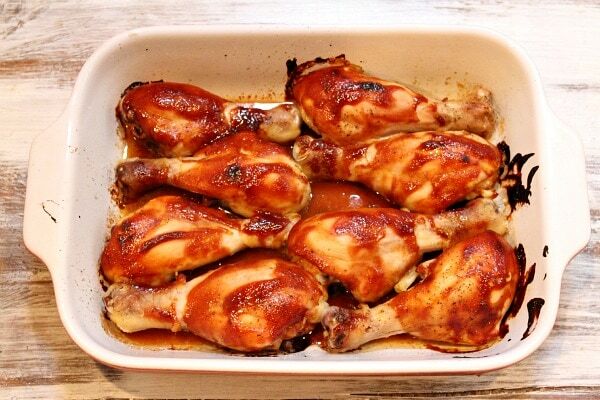 Spoon the sauce over the drumsticks and spread to cover the tops and the sides. 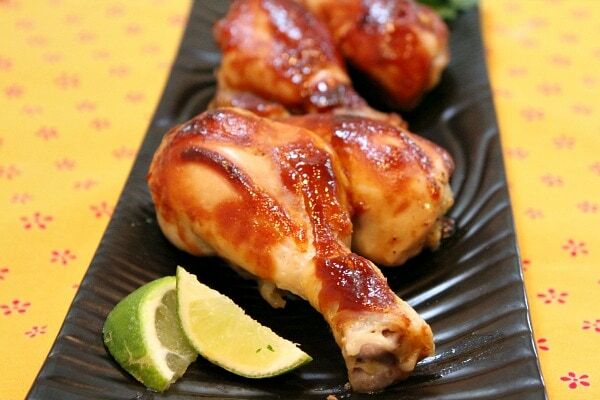 Bake for 50 to 60 minutes, or until the chicken is tender and juices run clear when pierced with a fork. If you are preparing this recipe as GLUTEN-FREE, just be sure to use a brand of hoisin sauce that is known to be free of gluten. If you are not familiar with hoisin sauce, you'll be able to locate it in your market's Asian food section.